Windows Phone 8X owners should be on the lookout for an upcoming software update hitting your device beginning tomorrow and addressing a number of bug-related issues. 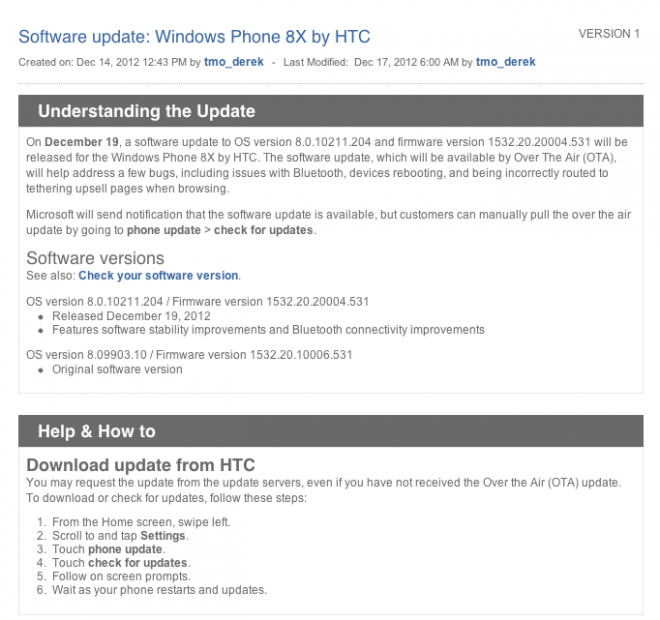 On December 19, a software update to OS version 8.0.10211.204 and firmware version 1532.20.20004.531 will be released for the Windows Phone 8X by HTC. The software update, which will be available by Over The Air (OTA), will help address a few bugs, including issues with Bluetooth, devices rebooting, and being incorrectly routed to tethering upsell pages when browsing. Microsoft will send a notification to your device alerting that an update is available, or you can manually look for the update by going to phone update > check for updates. Microsoft has yet to offer any official details on the update, but we’ll keep an eye on the T-Mobile support forum for any official details. I’m hoping to push out my Windows Phone 8X review later today or tomorrow but I may hold off and allow this update to come out. I’d love to hear from Windows Phone 8X in the coming days and let me know if you’ve seen a big improvement. An update has bug fixes? Preposterous! Now if MS / T-mo could just figure out why my wife isn’t able to receive pictures via mms, that’d be great! Try sending a picture message to yourself. Sometimes that fixes the issue. That works just fine. As done any other data access. T-mo is sending us a warranty replacement to see if that fixes it. Even though it’s pretty obvious to me that it’s either a software issue (which would require a patch/fix) or a network/account issue. Do you have a data plan? I gave my old HD7 to my sister who doesnt have a data plan and she had this issue. What she had to do was go into Settings and turned Data Connection on. She then turned on battery saver mode to prevent syncing to avoid data charges and that solved it. I have two 8x’s on my account and we can receive and send pictures just fine. Absolutely. Loyalty $20 unlimited data plan. The only issue is receiving pictures via MMS. All other data-centric functions work as expected. Yup, have done that countless times to no avail. Tmo has issued a warranty replacement phone, which didn’t fix the problem, and now have an open trouble ticket with engineering. sorta off topic question: the 8X was Free-after-rebates a few times for NEW customers, but I wasn’t eligible for upgrades back then, so couldn’t check the upgrade prices. It is $310 after tax/fee for my new full upgrade now. Has the 8X ever been $50-$100 before rebates for UPGRADES? thanks. i’m willing to wait couple weeks, but not at $310. When we bought it on upgrade, we went to Best Buy online. It was $99 and then they gave 5000 rewards points as a promo, which is worth $100 in reward certificates. I believe that promotion is still going on. I also have issues sending and receiving picture text messages on my 8X. Weak!